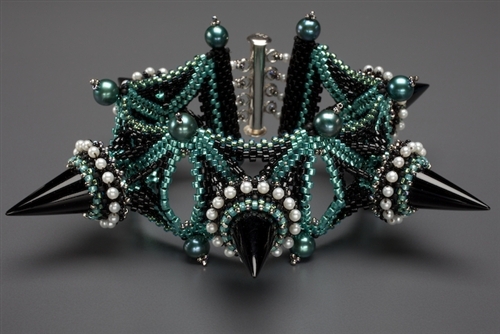 A truly unique and stunning bracelet made from antique black onyx points, tiny glass seed beads, and encrusted with fresh water gem pearls. Completed with a sterling silver slide clasp. Finished length when fastened is 6 3/4 inches. Fits a 6 1/4 inch wrist. 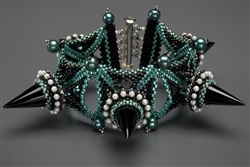 Bracelet is 1 1/4 inches wide. One of a kind. Due to the sculptural nature of this piece, care must be taken when wearing it.